A medical device manufacturer who has been using Creform built structures in its production facilities was faced with the problem of providing workstations for use in both its shipping and production departments to associates of various heights. 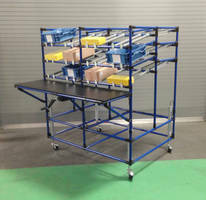 The workstations needed to be mobile, have multiple flow levels for component container feeding and the presentation of shipping supplies while also being height adjustable. In response, Creform Corporation (Greer, SC) designed new height adjustable, mobile workstations with versatility, good ergonomics and convenience. The workstations are built using the Creform System of plastic coated steel pipes, metal joints and accessories. As a mobile structure, it is easily moved to any point in a warehouse or production cell where associates can perform needed tasks. A unique feature, Ergo Lift, can raise or lower the units up to 12" with a simple hand crank. The Ergo Lift system, comprised of four hydraulic cylinders secured to each of the workstations vertical legs raises both the work surface and the entire structure at the same time. Since the company has multi-shift operations and people of various statures use the workstations, they can quickly and easily raise or lower the units to their respective heights. The system's lift capacity is 1000lb. The workstations have a plastic work surface that spans across the front. Three flow-levels above the work surface all have skatewheel conveyors and slide pipe for FIFO presentation with an angle created with slide pipe that enhances product visibility and physical access. The work surface can be set for stand-up or sit-down situations and its size is easily modified if required. Because the unit is made with Creform metal joints it can be easily modified or configured. The unit shown here is 72" W x 65" H x 50" D and has four 4" swivel, locking casters for easy rolling and positioning. Creform provides a wide selection of pipe colors so structures can easily be color coded by department or use. ESD pipe is also available for anti-static applications. A wide variety of accessories are available including information sheet holders, label holders, tool storage, overhead lighting, hooks for hanging tools and supplies. The Creform System is used to create an array of material handling and efficiency enhancing devices, including push, special purpose and trailer carts, flow racks, roller conveyors, workstations, and AGV/AGCs. The Creform System is a proven component in continuous improvement and Lean Manufacturing programs, and the company partners with customers in developing and implementing these programs.